New hair alert! If you’ve followed my blog over the last few (6 years – wow has it really been that long?!) years, you will have seen that I have sported a range of different hair cuts and colours over that time. I’ve been a red head, I went purple for a bit, I’ve had full fringes, but most prominently I spent three years with blonde running through the ends of my hair. This was until I had my hair chopped off to just below my shoulders, towards the end of 2015. This was a big moment for me, who had had long hair my entire life. Along with it, I moved my parting to the centre and cut all of the blonde out of my hair. At the time I was pleased to welcome back my dark brown locks, but over the last couple of months I have been itching for a change and have been re-considering the blonde. 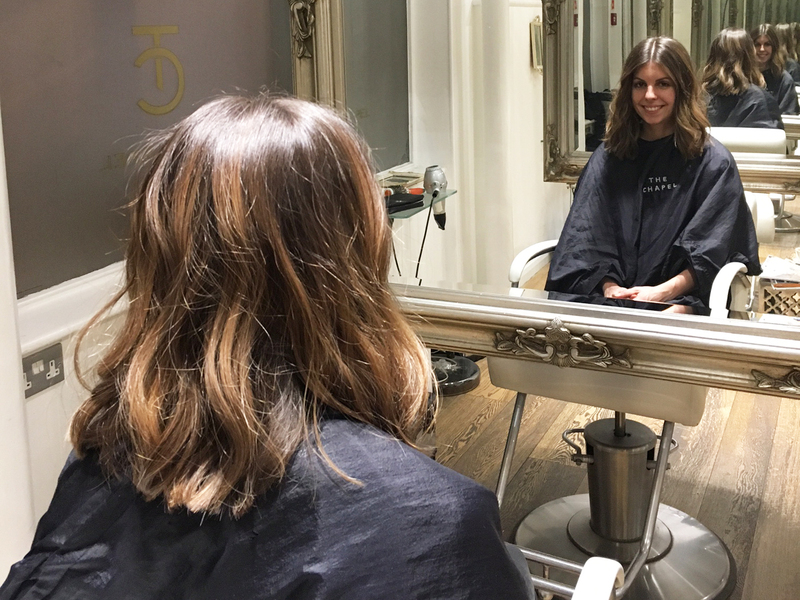 Since I originally coloured my hair, a technique called balayage has been made famous by the likes of many celebrities, and is a way of lightening the hair in a more natural looking way. 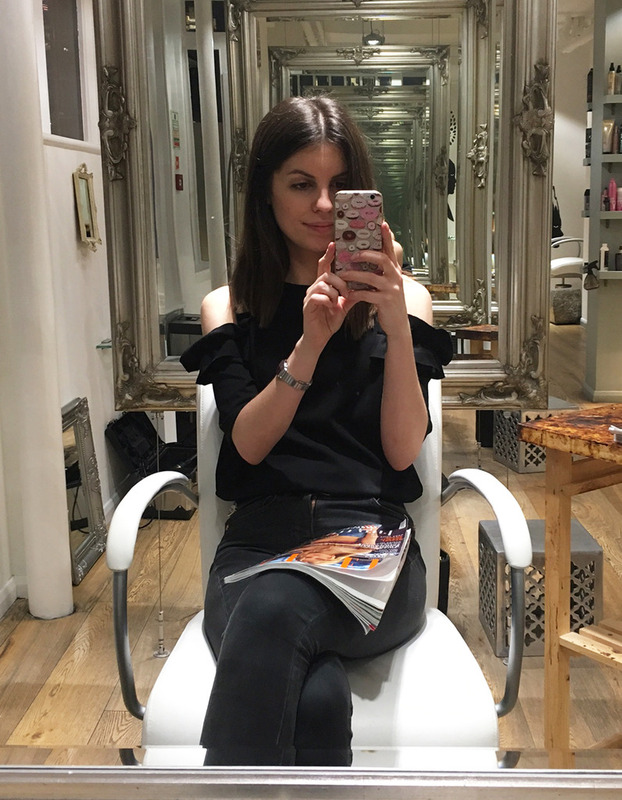 So when I booked in for a hair consultation at The Chapel hair salon in Islington, I talked the idea through with my stylist Kim, who was very supportive of the idea. 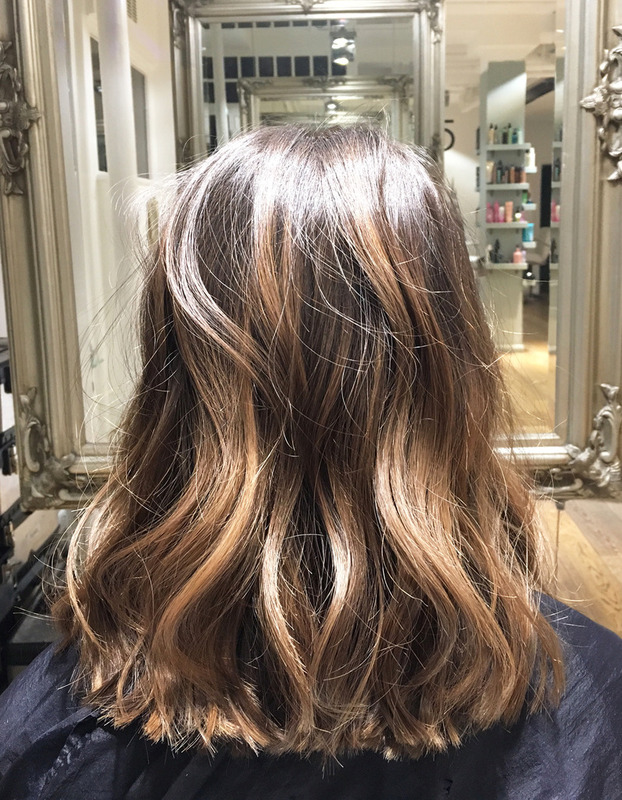 She agreed that balayage would give a much more subtle and natural look to my hair, without it necessarily looking as though it had been dyed. So I had a coloiur test and a couple of weeks later I was back at The Chapel ready for my cut and colour. On arrival I was offered a drink, to which I chose a glass of juice and it came with a complimentary Kit-Kat, which disappeared in less than a minute! Shortly afterwards Kim led me through to the cutting room and I was greeted with the most impressive hair salon I had ever had the pleasure of having my hair cut in. The Chapel in Islington is an incredibly large space, with white walls and exposed brick work. White leather chairs with stainless steel bases, and large silver mirrors hanging from the ceiling, help create an industrial style to the space, whilst giving it an air of ‘art gallery’ to it. It’s really rather beautiful. 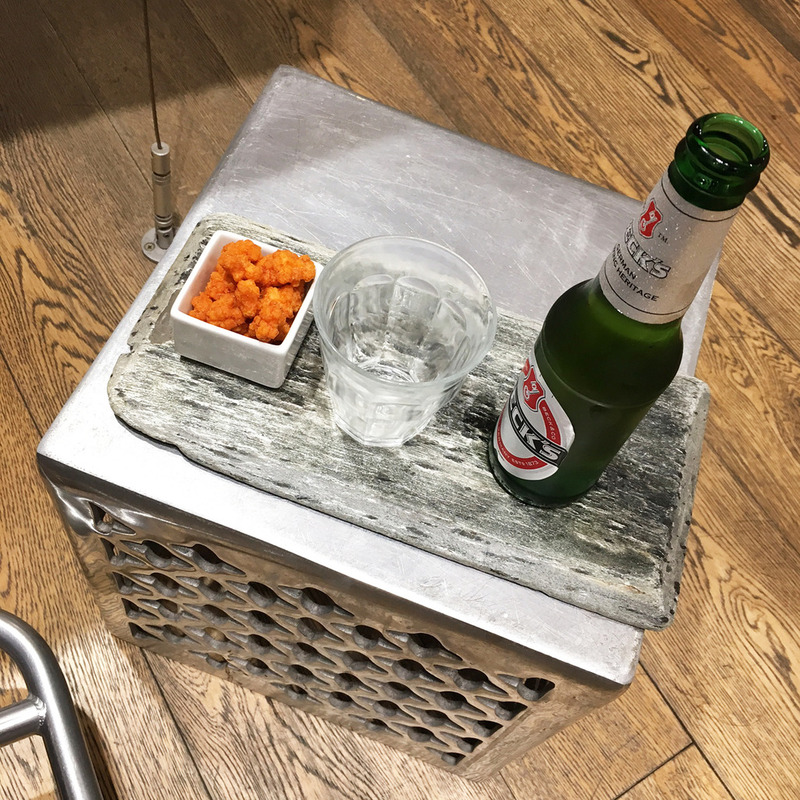 Every detail has been considered, from the small metal tables, to the slate serving boards for your drink. Once in my chair, staring at the most incredible mirrors in front and behind me (wish I could steel one for my bedroom), Kim placed a gown around me and began to mix my colour. After a short while, my head was covered in foil and I was offered a more comfortable seat in one of the extremely plush, velvet sofas in the salon. I was also kindly offered another drink, and I decide to opt for a beer this time round, which came with delicious chilli crackers. After what seemed like no time at all, I was whisked downstairs to the basin where Kim rinsed my colour off. Even the hair washing facilities at The Chapel are exuberant – the foot rest of the chair comes up to offer a more comfortable position, the lights are dimmed and a heated towel is placed over you. I was so snug and warm that when Kim began to massage my head, I thought I might fall asleep! Once shampooed and conditioned, it was back upstairs for my cut. I was already happy with the style of my hair so I really only wanted a trim, but I was happy for Kim to take off as much as she thought it needed, as I knew it wasn’t in great condition. She also shaped my hair a little around the front to frame my face, as it had got quite heavy, and chopped into my hair to give it more movement. As she blow dried my hair I was excited to see the colour. As it began to show through a smile widened across my face. I have never been so thrilled with my hair colour before! When you ask for ‘natural’ highlights, you know it’s never really going to be natural. However, Kim has honestly managed to lighten my hair so well that it does look natural! In fact, it looks as though I’ve been on holiday, and my hair has lightened from the sun. I really don’t think I’ve ever left a salon before being so pleased, and really feeling as though the stylist completely understood what I wanted. So thank you Kim! The following day at work I was greeted with compliments from my colleagues, many of whom immediately asked me for the salons details as they too couldn’t believe what a good job Kim had achieved. This weekend I traveled back to my parents for a childhood friend’s birthday. Having not seen anyone for at least a couple of months, they didn’t realise straight away that I’d had my hair coloured. Instead they presumed I’d been away on holiday! This also means that I have finally found a salon that I am confident in and will 100% return to. 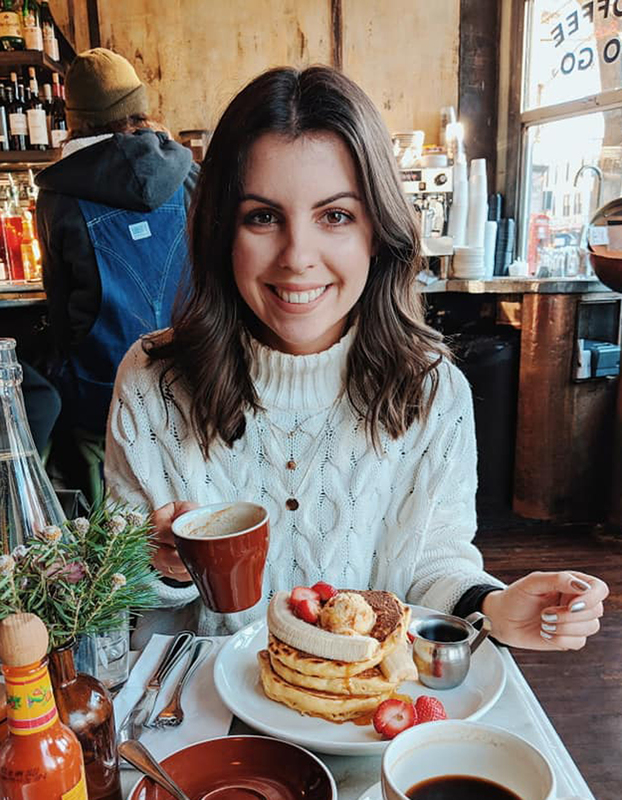 It can be so difficult finding a salon you like when you move to a new city, and your hair has so much importance that you become very attached to it (and very emotional over it if you’re like me!). So t’s fantastic when you find a salon and stylist that you trust. I can’t wait to head back in 8-10 weeks for a trim. Do you like the balayage look? 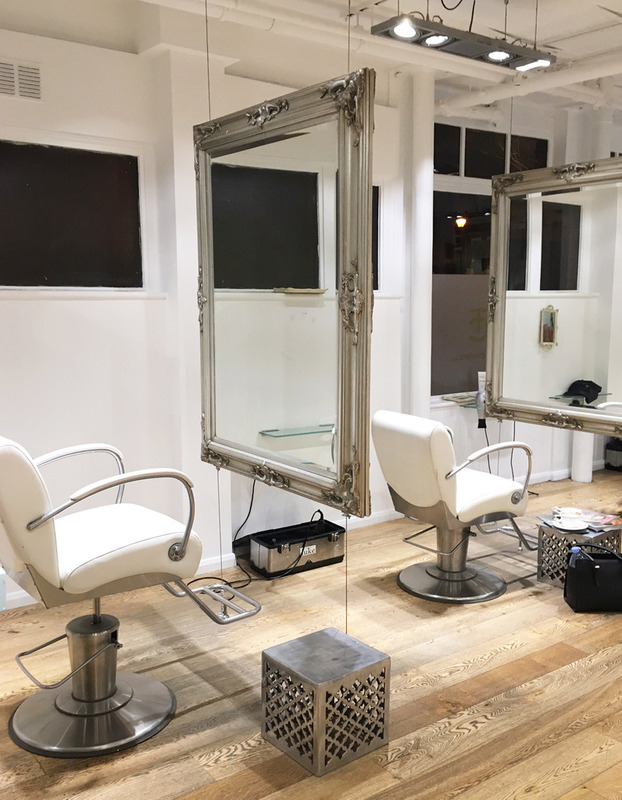 Do you have a ‘go-to’ hair salon or stylist?